Access to Mobile Communication is the Difference Between Abject Poverty and Hope. Men and women communicate differently. That is no secret. In order for women in developing countries to learn to share power with men, and thereby become more effective in promoting food security, rural development, and contribute to other societal advancement, we must become critically aware of gender-sensitive communication. These are vital building blocks that will have an impact on generations to come. Poverty has a different definition in the emerging world than it does in developed nations. The term ‘poverty’ is used broadly in the emerging world to include lack of material resources, minimal or no access to healthcare, limited access to education and information, deprivation of civil rights, minimal — if any — access to economic growth opportunity, professional training and access to capital. In broad strokes, alleviation of proverty would mean betterment of any of these challenges, although measurement of improvement is difficult to measure. Change takes time. A fast track to addressing poverty at all of its levels is access to information. Access to mobile communication is the difference between abject poverty and hope. This hope will quickly turn into action as newly empowered communities will have access to information beyond the traditional media of television, radio and telephone, which are now all accessible via Internet. Great personal evolution and economic growth will result when previously isolated communities reach out to the rest of the world. Likely, their shortcut to commerce come through embracing digital currencies over cumbersome microfinance instruments. At Powerstorm Capital Corp., we see a future on the near horizon where our hybrid power solutions will greatly contribute to establishment of thriving communities throughout the emerging world. Peacocks symbolize grace, pride, and beauty. They are a sign of joy for all who see them. 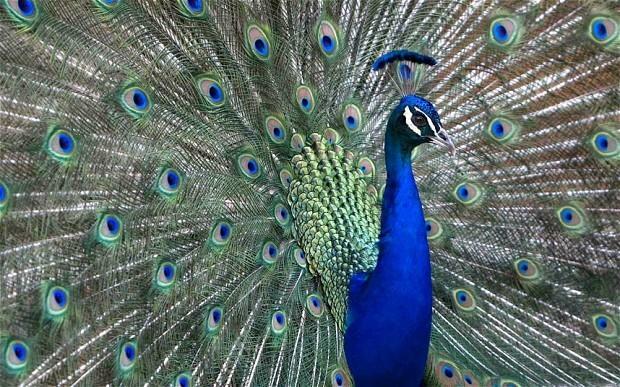 In India, where the peacock symbolizes knowledge and wisdom, it is considered sacred. In China, where the peacock symbolizes purity, it is considered sacred. At Powerstorm Capital we present the peacock to symbolize the nature of our work, rooted as it is in striving to advance knowledge and to discover truth and wisdom.